I was thinking about staying home from PyCon in 2013. I know, that's a horrible idea. But financing the trip has gotten hard recently, and I want to spend weeks and weeks in Montreal for PyCon 2014, so I was thinking maybe I'd save up my travel money for a spectacular trip to Quebec in a year. But now look what they've done. PyPgDay. Postgres and Python. They've got my number. Resistance is futile. The CFP is out; I'll be thinking about what I can propose. Maybe this will lead to a spasm of EDD (embarrassment-driven development) on sqlpython and cmd2. So keep close watch over your kidneys, because I may resort to stealing them to make the trip, but I'll see you in Santa Clara. 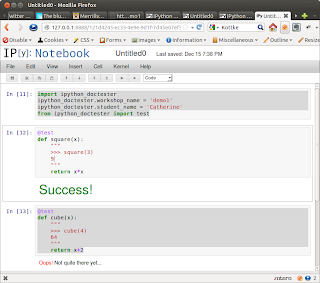 The big improvement for 0.2 is that ipython_doctester now optionally reports test results to an instructor's webapp, http://ipython-docent.appspot.com. In a classroom setting, this helps a teacher see who needs more time or help. The instructor should run through the notebook first, executing all cells just to register each of the function names in order. 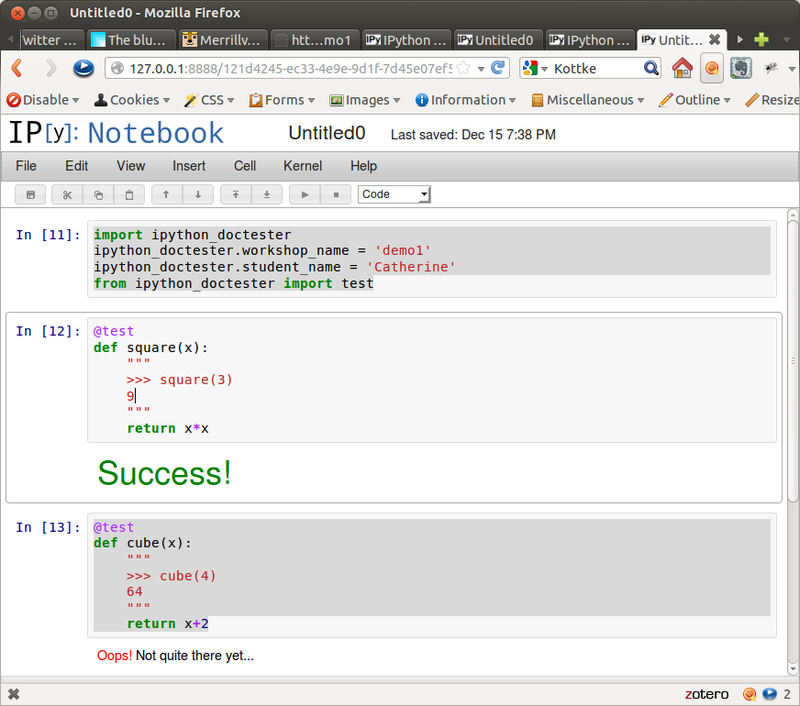 Then she can check on the class's progress at http://ipython-docent.appspot.com/workshop_name. You can also optionally set ipython_doctester.verbose = True to get the full table of results for every exercise, even the successes. 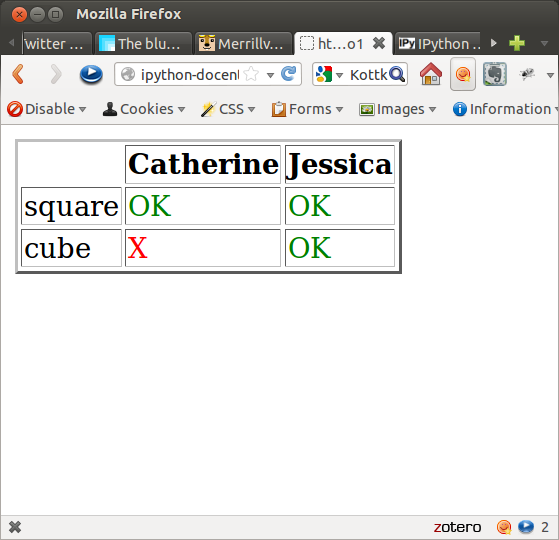 I plan to use this for the Columbus Python Workshop on Jan 18-19. Anyone you know from central Ohio needs to hear about this class!